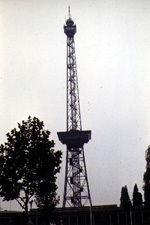 The Berlin television and radio broadcasting tower called the "Rundfunkturm." This is the East Berlin broadcasting tower called the " Pope's Revenge." Photographers try to capture the cross on the orb caused by the reflecting sun at a certain time of day and angle of view. 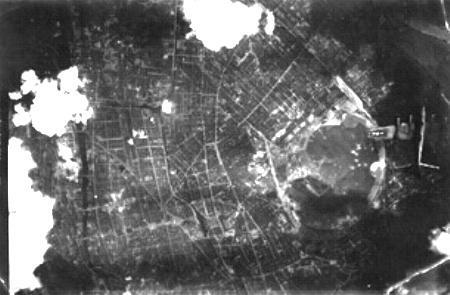 This is a photo that my father, George Ford, born 1921 in Longview, Texas, took from his airplane over Berlin in April, 1944. He was a U.S. Army Air Corps B-17 bombardier, with the 94th Bomber Group, based in Ipswitch, England. He flew 50 missions over Europe. Only 30 were required to be eligbible to be allowed to go back home to the good old USA! He captioned this one in pencil on the back, "Seeing Europe courtesy of the 94th." 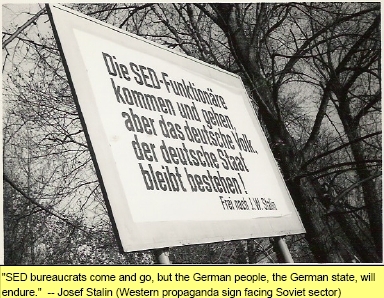 We Field Station Berlin Vets can thank him for creating the rubble which mostly women workers gathered together in postwar Berlin to form the pile known as Teufelsberg upon which we worked. I think this view is centered between the Panke River and the Sommerbad at Volkspark Humboldthain in Wedding Bezirke, just north of downtown Berlin. I think the terrain features in the photo look very similar to the map of that area. Look for yourself at the internet website map page (It's an outside link, so use your back bar to return here). Enter coordinates: Langengrad: 113.3835748, Breitengrad 52.5469150. The scene is most clearly viewed at the smallest scale there. However, the large scale aerial shot there, from much higher, is still recognizable. 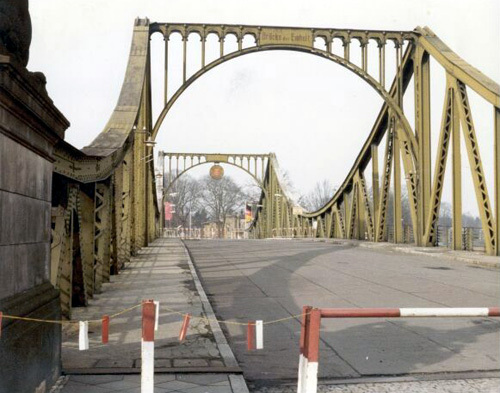 Andrews Barracks was SSE of Berlin center in Zehlendorf Bezirke (district). If anyone thinks this shot is of a different area, please let me know. It seems quite distinctive to me. The ball park shaped area looks like the Sommerbad (royal summer baths), a distinctive landmark. I could be wrong. I am not an aerial photo-interpreter. The B-17 in which my dad was flying was named "Janey Gal," after Jane Russel, the movie star. A lovely painting of a scantily-clad, provocatively-posed Jane Russel, from a movie poster, graced the nose of the bomber. I have photos of the aircraft and its crew. There was a unit-identifying "block A" (big letter A inside of a vertical rectangle) on the tail surface. At the beginning of WWII, he was in the Texas Army National Guard. He opted for active duty in the new Army Air Corps. 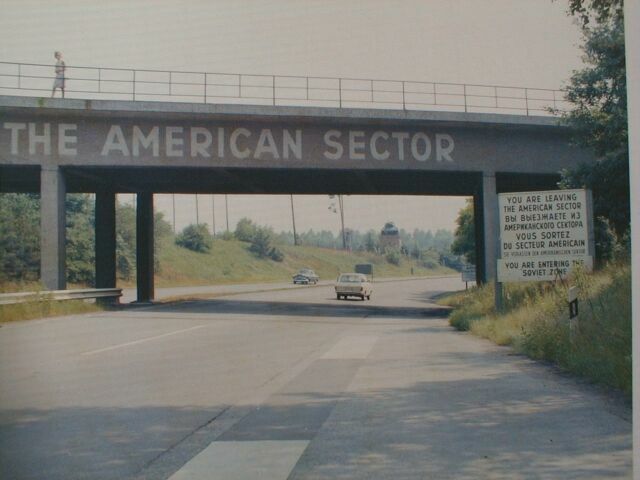 At the time of this photo, he was a Technical sergeant (equivalent to SP5 in our army) in the U.S. Army Air Corps stationed for two years in Ipswitch, England. After WWII, he went to one of the first new US Air Force OCS classes at Lackland AFB, San Antonio, Texas. During the Korean War, he did combat intelligence in Korea investigating crashed enemy aircraft. In the 50's, as a Captain, he got his bachelor of science degree at the University of Maryland, and taught AFROTC there. For many years he was a staff officer for tactical nuclear targets intelligence at bases around the world. He retired as a Major commanding the 614th Tactical Air Command fighter squadron at Kelly Air Force Base, Alexandria, Louisiana. In retirement, he earned a masters degree in political science at Louisiana State University in Baton Rouge, Louisiana. He taught government courses in Corpus Christi, Texas, retired again, and taught high school classes in his home town before retiring again. He travelled extensively during his final retirement in Mexico, Europe, Russia, Korea, and China. He passed away on February 18, 1998, of a sudden heart attack. 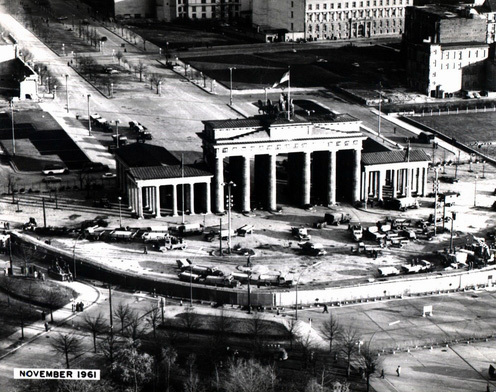 Guess what's happenning here at the Brandenburger Tor in 1961. 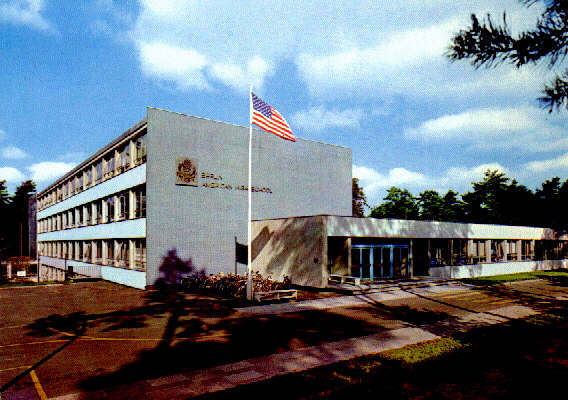 The Berlin American high school, which is now called the Wilma Rudolph school. 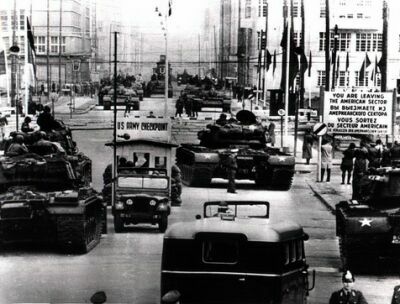 The confrontation of US and USSR tanks across the border at check point Charlie that led to the Berlin blocade and airlift. Through a B-17 Bomb sight. 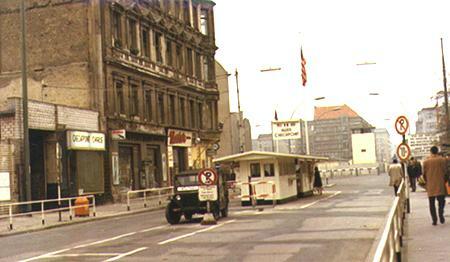 Berlin Airlift Crash - this plane went down at the edge of Tempelhof just short of the runway. I've seen this picture, or ones just like it, elsewhere. Dad must have been friends with the photographer. He didn't take them. He was a Ranger. Berlin Parade - a parade for General Mark Clark at McNair Barracks. 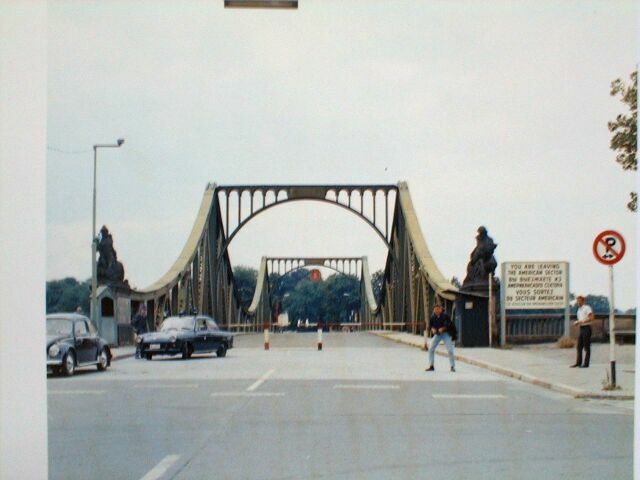 Old Peoples Bridge - so named because this is where they would let people too old to work cross to the West. Patrol Boat on the River Spree. This ain't the Lifeguard boat. 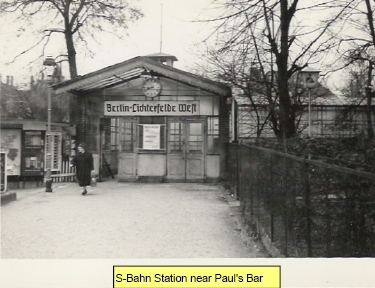 At left, the Berlin-Licterfelde S-Bahn Station West, from Barry Bates, whose photo is on our Member's mug shots photo page. Also from Barry is the photo of the propaganda sign, below, and the photo of Linda's bar on our Bars page. Barry Bates was at FSB nearly 40 years ago.